In the past days we reported about the ongoing hunger strike for the freedom of movement on Lesvos. Today eleven refugees started a hunger strike during a protest at Syntagma square in Athens, Greece. Image: Protesting refugees on Syntagma square in Athens. Image by “Reunite us with our families now” Facebook page.Published by Enough is Enough. Read all our reports about #RefugeesGR; here. As we reported yesterday, today women and minors joined the hunger strikers on Sappho square on Lesvos. But the inhuman border policies of the European Union also hits refugees on the Greek main land. 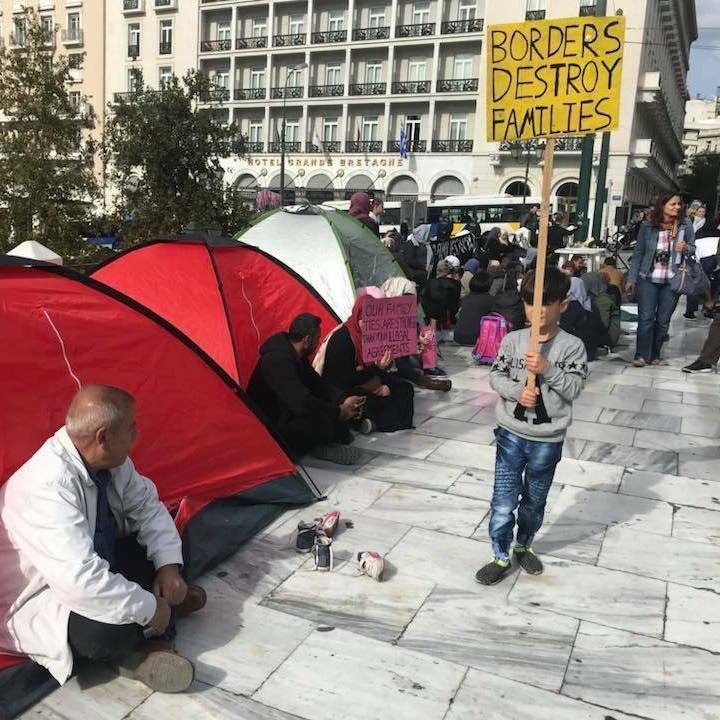 During a protest for family reunification eleven refugees started a hunger strike in down town Athens, right before the building of the Greek parliament. At 7pm (local time) tonight, there will be a solidarity assembly on Syntagma square and tomorrow morning there will be a press conference (11:00am, local time). Reunite us with our families now! After more than four months of protests in front of the Greek Asylum Service and the German Embassy; after more than one and a half year in Greece enduring under precarious conditions in the tent camps of Idomeni and Piraeus as well as the provisory military camps of the mainland and the infamous hotspots of the Aegean islands; after years escaping war and death in Syria, Iraq, Afghanistan and elsewhere; today our torn families are still trying to reunite and finally live in peace. We are currently more than 4,500 persons awaiting our transfer in the frame of family reunification procedures to Germany. We are families waiting already more than 18 months in Greece for our reunification to be completed. We are mothers and fathers separated from their children or spouses, grandparents or other relatives. Most importantly, among us are many children. Some of us even have their kids who got separated from us during the flight waiting alone in Germany. We escaped from war-torn countries to find protection near our beloved but we found ourselves trapped in Greece along with thousands of other refugees. There are many unaccompanied minors, sick people, elderly, disabled, single mothers and victims of torture and other forms of exploitation or violence among us. Most of us have received the acceptance from Germany since more than 6 months, passing the maximum deadline for the transfer as defined by European Law due to an unofficial agreement between Germany and Greece. Our waiting period has reached in average nine months from the date of acceptance. We do not know when it will be our turn and when we will travel. We all still have to pay our tickets by ourselves, another fact violating law and often one further obstacle for our reunification. Today on November 1 st of 2017 we are 11 persons who decided to start a hunger strike in order to move our struggle onwards. With this decision, we want to shout out against the cruel migration policy of deterrence that Europe imposes on us and our families; a repressive system that is aimed to unnerve us and let us give up. But we will stand upright. We want to tear down the walls that stop us from being with our fathers, mothers, spouses and children or the rest of our family. We herewith also salute our friends, brothers and sisters in Lesvos, who are in hunger strike since already six days fighting freedom of movement, against deportations and the EU-Turkey Deal, against their incarceration on the Aegean Islands and the inhuman living conditions in the European hot-spots that put refugee lives in danger. We invite you all to join our press conference scheduled for Thursday 2nd 2017 at 11am, where we will be able to tell you more about our struggle and our personal motives to take this step. No more limitations of transfers to any EU-country! No more discrimination! Equal rights for all! No more inhuman living conditions! No more lives in danger in Greece! The right to stay and freedom of movement to all! #Berlin Nov 8: Demo in Solidarity with #RefugeesGR Hunger Strike in #Athens | Enough is Enough!